This time of the year since 1987, the Philippine mass media invariably lends an inordinate amount of print space and air time to political personalities, pundits, and chroniclers of modern history, even ordinary eyewitnesses, who wax nostalgic about the events surrounding the “people power” or unarmed uprising in Metro Manila that toppled the fascist dictator Marcos. Unfortunately, the narrative about EDSA 1 as a political phenomenon is dominated by the notion that it was simply a fortuitous happenstance, if not a miracle, that millions of people poured out into the streets in response to Cardinal Sin’s call to stop Marcos loyalist tanks and troops from attacking the coup plotters holed up in Camp Aguinaldo. Credit for igniting the chain of events is given to then Defense Secretary Juan Ponce Enrile and erstwhile Marcos co-conspirator and martial law enforcer, PC Chief and AFP Vice Chief of Staff Fidel Ramos and Enrile’s aide-de-camp Gregorio “Gringo” Honasan for plotting the military coup against Marcos. Although they were discovered and ordered arrested before they could make their move, they eventually drew more of the military and police top brass to defect to the rebels’ side as the mass of people swelled to hundreds of thousands to more than a million in front of the two military camps Aguinaldo and Crame. Corazon “Cory” Aquino, the widow of the assassinated opposition leader Ninoy Aquino, is credited for rallying the people against the dictator Marcos after her husband was assassinated, of utilizing the snap presidential elections to offer herself as an alternative to Marcos, and of galvanizing massive protests leading up to acts of civil disobedience to reject Marcos’ claim of having won the elections. Buried under the tons of materials describing EDSA 1 as nothing short of a miracle is the significance of another momentous “uprising” against the oppressive Marcos regime and the exploitative ruling system that created and nurtured “people power” – the First Quarter Storm (FQS) of 1970. The FQS was the series of protest mass actions, which began on Jan 25, 1970, and continued up to March of 1970. It has been vividly recorded in veteran journalist Pete Lacaba’s account Days of Disquiet, Nights of Rage, a must-read book for those who would relive those turbulent, invigorating days, as well as a series of articles in Ang Bayan, the official organ of the Communist Party of the Philippines, that diligently chronicled each event and described its historical significance in real time. While the FQS is generally believed to be an upsurge in the youth and student movement and was in fact participated in by a broad array of youth and student organizations, its impact derives from its breaking out of the narrow confines of school issues and concerns, linking these to the issues and demands of the broader majority of Filipinos, especially the toiling peasants and workers and spearheading a series of massive and militant protest actions against the three pillars of the ruling system: imperialism, feudalism and bureaucrat capitalism. The FQS witnessed the rise of the militant youth and students in the urban center of Manila and outlying cities and towns, all the way to Southern Tagalog and Central Luzon, against the Marcos regime, as the concentrated expression, or shall we say, incarnation, of these 3 basic problems or “isms” of Philippine society. The first two-term president was denounced as “Marcos, Hitler, Diktador, Tuta!” in countless mass actions that were replicated in provincial capitols and cities nationwide. The armies of the youth were comprised primarily of students and out-of-school youth, but there were also workers, peasants, and even professionals. Their numbers grew in leaps and bounds from tens of thousands to more than a hundred thousand as, week after week, the violent and often brutal response of the state to their protest actions only further fueled unrest and fired up resistance. 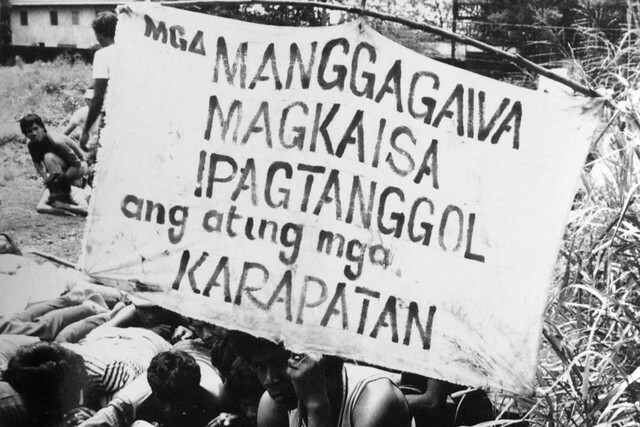 Thus the defiant slogans “Makibaka, huwag matakot!” and “Digmang bayan, sagot sa martial law!” reverberated in the streets, schools, workplaces, and communities as the youth conducted their “DGs” or discussion groups, “pulong bayan” or community mass meetings, and capped these with rallies and demonstrations all over the city with favored converging points: Malacaňang, the US embassy, Congress, and Plaza Miranda. This meant they would live among the “poor, deprive and oppressed” (as progressive church people phrased it); to learn from and be one with them in their struggles for decent wages, against trade union repression, demolitions of their shanty towns, for their right to own the lands they tilled and to defend themselves against harassments, displacement through land grabbing, and outright killings of their leaders and members. In the same breath the reactionaries praised the “moderates” who also railed against the endemic poverty, the social inequity and injustice, and the monopoly by a few of the resources, wealth and power of the country but placed their hopes in a “constitutional convention” that would reform society and had blinders as to the interference of Western big powers and conjoint economic interests in the economic, political and cultural affairs of the nation. Many in that generation went on to embrace revolutionary philosophies, committed themselves to revolutionary aspirations and political programs, and even joined revolutionary organizations such as the Kabataang Makabayan (KM), the Samahang Demokratiko ng Kabataan (SDK), the Malayang Kilusang ng Bagong Kababaihan (Makibaka) and the Katipunan ng mga Gurong Makabayan (Kaguma) that were then still legal and aboveground. The imposition of martial law sent the activists born of the FQS whirlwind into the urban underground or else to the countryside to arouse, organize, and mobilize the people to fight the US-backed Marcos fascist dictatorship. The option to join the people’s war – to fight counterrevolutionary violence of the ruling elite with the revolutionary violence of the people – became a pressing reality for many. Thus a close look at the names of the martial law martyrs engraved in the Wall of Remembrance at the Bantayog ng mga Bayani will reveal that many if not most were members of the Communist Party of the Philippines (CPP), the New People’s Army (NPA) and the scores of “NGUGMOs” or national democratic underground mass organizations that grew like wild flowers under the searing heat of the martial law repressive years. The First Quarter Storm of 1970 was the key to the accelerated growth of legal mass organizations and such revolutionary forces as the CPP, NPA and the main components of what would become the National Democratic Front of the Philippines (NDFP). And these revolutionary organizations carried the torch of armed and unarmed resistance against the US-Marcos dictatorship from September 21, 1972 to February 25, 1986. It was their persistence, courage, and heavy sacrifices that sapped the strength of the US-trained and equipped AFP which then included the notorious Philippine Constabulary (PC) in the dictatorship’s counterinsurgency campaigns nationwide. Their cadres and activists undertook painstaking and relentless organizing among the middle forces of church people, professionals, artists, businessmen, media practitioners and the like. They broke new ground by organizing the many indigenous people’s groups including the Igorot (Cordillera people) through the Cordillera People’s Democratic Front (CPDF) and the Moro Revolutionary Organization (Moro). They founded a strong and militant human rights movement of victims and advocates. And they also reached out to the anti-Marcos opposition, from the nationalists like Lorenzo M. Taňada and Jose W. Diokno, the liberals like Joker Arroyo, Rene Saguisag and Jovito Salonga and the conservative politicians like Soc Rodrigo, Eva Estrada Kalaw, Gerry Roxas and Salvador “Doy” Laurel not to mention the “non-politician” Cory Aquino. They were even able to penetrate the AFP to draw into their fold such patriotic officers as Lieutenants Crispin Tagamolila, Victor Corpuz and many others. It is not an exaggeration to say that the seeds of the national democratic revolution were thus cast and sown throughout the islands when thousands of FQS activists fanned out to fearlessly confront the fascist dictatorship through various forms of resistance and struggle including a protracted people’s war. The correctness of the national democratic analysis and program was proven over the next two decades. Despite all the might and resources thrown against it by the US-Marcos dictatorship, the revolutionary movement not only survived but grew deep roots among the people and increased in number, scope and strength. Thus any narrative of the famed 1986 People Power Revolution – EDSA 1 – could only be accurate and complete by taking into proper account the arduous years of resistance and revolutionary struggle that followed the First Quarter Storm of 1970.